This year we are offering a wider choice of T-shirts and polo shirts to celebrate our new Contagious logo and our new MAX and GO logos. Take a look at the photos below and see what colour and style you would like to wear at Contagious 2019! 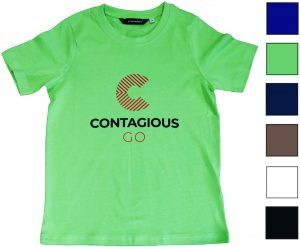 To place your T-shirt and/or polo shirt order please follow the step-by-step instructions on the booking form when you book your place on Contagious 2019; your order will be sent to your conference in the summer ready for you to wear during your Contagious week. The 100% cotton crew-neck T-shirts cost just £10 and have either the GO logo or the MAX logo on the front and come in a choice of several colours (see below). 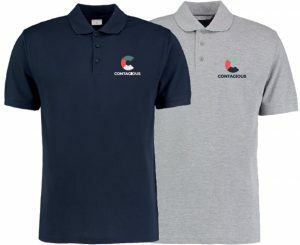 The polo Shirts, with the Contagious logo beautifully embroidered on the left side, cost £22 and are available in Navy or Grey. The GO T-shirt is offered in ROYAL, GREEN, NAVY, GREY, WHITE and BLACK. You can choose from sizes 140, 152, S, M, L, XL + XXL. 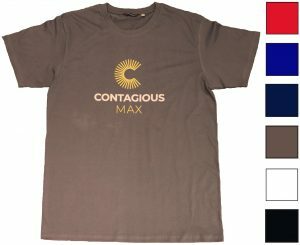 The MAX T-shirt is offered in RED, ROYAL, NAVY, GREY, WHITE and BLACK. You can choose from sizes S, M, L, XL + XXL. The polo shirts, with the Contagious logo beautifully embroidered on the left side, cost £22 and are available in NAVY or GREY and can be ordered in sizes S, M, L, XL + XXL. We look forward to seeing what you will be wearing this summer!